The Midwest TQ Racing League is saddened to announce that Bobby Jones, 75, of Rushville, Ind., passed away peacefully at his home on February 1, 2017, surrounded by his family. If you had attended a three-quarter midget race in the past 30 years or so you were certain to see Bobby working as an official, either in the pits directing cars or using a four wheeler to start them. When the MTQRL was formed in the fall of 2008 Mark and Jennifer Frechette hired Bobby as a pit steward, a position he held until the final MTQRL race in 2015. 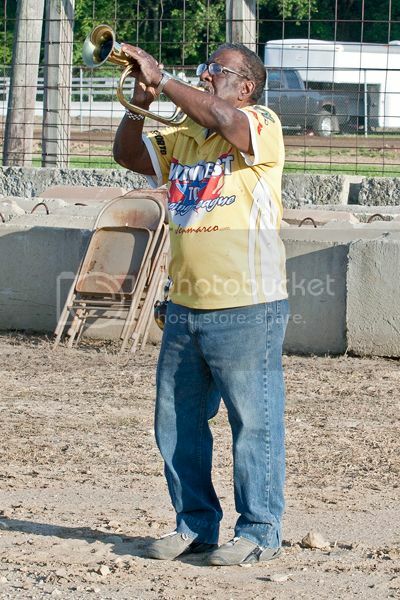 In addition to his duties during the race, Bobby would sometimes participate in the opening ceremonies where he would play Taps on his trumpet, which was always a fan favorite. The Midwest TQ Racing League wishes to extend its deepest sympathies to the friends and family of Bobby Jones, he will be greatly missed. Robert E. “Bobby” Jones was born on December 26, 1941, in Rushville to the late John T. and Martha (Easley) Jones. Bobby married Anna Jo Jones on November 23, 1993, and she preceded him in death on February 10, 2008. Bobby worked part-time for the City of Rushville as the sanitation engineer and spent 24 years at the Copeland Corporation in Rushville. Bobby was a member of Sexton Christian Church and part of the Rush County Veteran’s Honor Guard. He enjoyed helping at the three-quarter midget races, playing golf and fishing. Bobby was an avid horse enthusiast and he also loved to barbecue with family and friends. Bobby is survived by his loving daughters Bobby Jo Jones of Rushville, Toni (Marthella) Jones of Lafayette, Terri KuKaski of Columbia, South Carolina, Tisha Martin of Newport News, Virginia, a brother, Harry Jones of Connersville, sisters Diane Kessler of Ohio and Mary Alice Hester of Indianapolis, twelve grandchildren and thirteen great-grandchildren. Bobby was preceded in death by his loving wife, Anna Jo (Harper) Jones, a son, Robert E. Jones, Jr., his parents, John T. and Martha (Easley) Jones, and a brother John T. “Butter Ball” Jones, Jr.
Services will be held On Monday, February 6, 2017, at 11:00 am at the Moster Mortuary, 334 N. Main Street, Rushville, Ind. with Rev. Alex Fahie presiding. Friends are welcome to visit at the mortuary on Sunday, February 5th from 2:00-7:00 pm. Burial will take place in Rushville’s East Hill Cemetery. Memorial contributions may be made to Steed Motorsports.